Vocal Score not available until after the world premiere in New York 13 - 17 January 2012. Following many requests from choirs and several months work we are delighted to have completed the ChoraLine SATB voice part rehearsal CD and MP3 for Howard Goodall's  Eternal Light: A Requiem. Our thanks and appreciation goes to Brian Kay who has worked with us on this piece and who also features on the ChoraLine recording to assist with the pronunciation of the latin words. We believe a combination of the wealth of experience and depth of knowledge added by Brian Kay, the concise vocal cues from Martin Muncaster and the superb production and recording skills from Lloyd Silverthorne make this one of the best ChoraLine works to date. The Lord is My Shepherd (Psalm 23) is also included on this ChoraLine recording. A wonderful piece which became the theme for the BBC TV series The Vicar of Dibley. The writing of a Requiem is a special challenge for any composer. The great Requiems of the past by composers such as Mozart, Verdi and Berlioz interpret the sacred Requiem text literally, offering prayers of salvation for the departed, whose souls are assumed to be in purgatory facing a terrible judgement. Eternal Light: A Requiem is, by contrast, intended to provide solace to the grieving, reflecting on the words of the Latin Mass by juxtaposing them with poems in English. For me, a modern Requiem is one that acknowledges the unbearable loss and emptiness that accompanies the death of loved ones, a loss that is not easily ameliorated with platitudes about the joy waiting us in the afterlife. This, like Brahms', is a Requiem for the living, addressing their suffering and endurance, A Requiem focussing on the consequences of  interrupted lives. 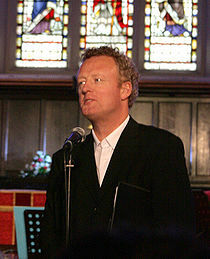 Howard Goodall, June 2008.